The state is home to more than 12,000 exporters, 90 percent of which are small and medium-sized companies with fewer than 500 employees, the report notes. Washington’s leading exports include aerospace products and parts, cement and concrete products, seafood products and computer software – with exports of both goods and services representing 18.3 percent of the state’s total gross domestic product (GDP). Some 215 countries and territories buy Washington-produced goods and services ― including companies in top export markets like Canada and China ― and nearly 116,000 workers in Washington are employed by foreign-owned companies. Exports and imports involving Canada and Mexico alone supported more than 277,000 jobs in Washington in 2017 (the most recent data available), with exports to those two nations valued at $12.4 billion that year. Washington’s exports to Canada and Mexico have increased by 359 percent, or $7.6 billion, since the North American Free Trade Agreement (NAFTA) was implemented in 1994, according to the report. The Business Roundtable, which is an association of chief executive officers from the nation’s leading companies, prepared the report, in part, to bolster the case for congressional approval of the pending U.S.-Mexico-Canada Agreement (USMCA), which will replace the NAFTA. 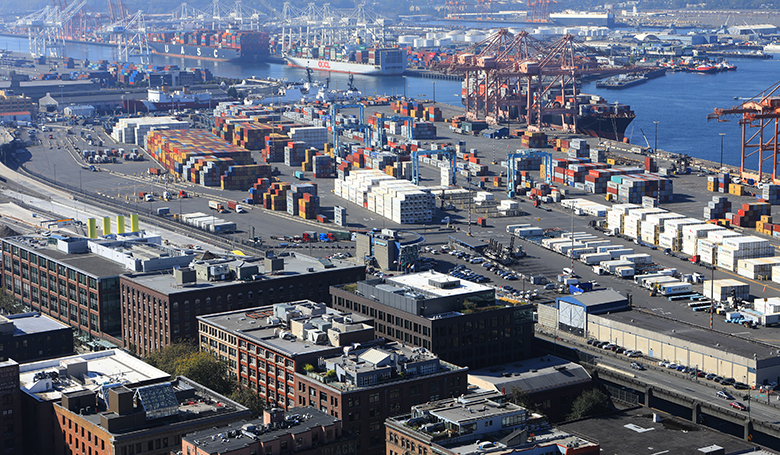 On another front of the international trade market, a recent report by the Washington Council on International Trade (WCIT) revealed that some 14 percent of U.S. exports to China come from Washington state, representing $13.8 billion in merchandise and commodities and an additional $1.6 billion in services. King County accounts for the single largest source within the state of merchandise and commodity exports to China, an estimated $5.9 billion in sales ― the bulk of that aerospace exports. Statewide, some $648.8 million in cars and auto parts were exported to China in 2017 and an additional $210 million in auto products imported ― with Washington ports such as Olympia and Grays Harbor playing a key role in facilitating that trade and the many logistics and shipping jobs it supports, according to the WCTI report. The state also exported to China $17.6 million worth of apples, $99.7 million worth of cherries and $248.4 million worth of wheat in 2017.